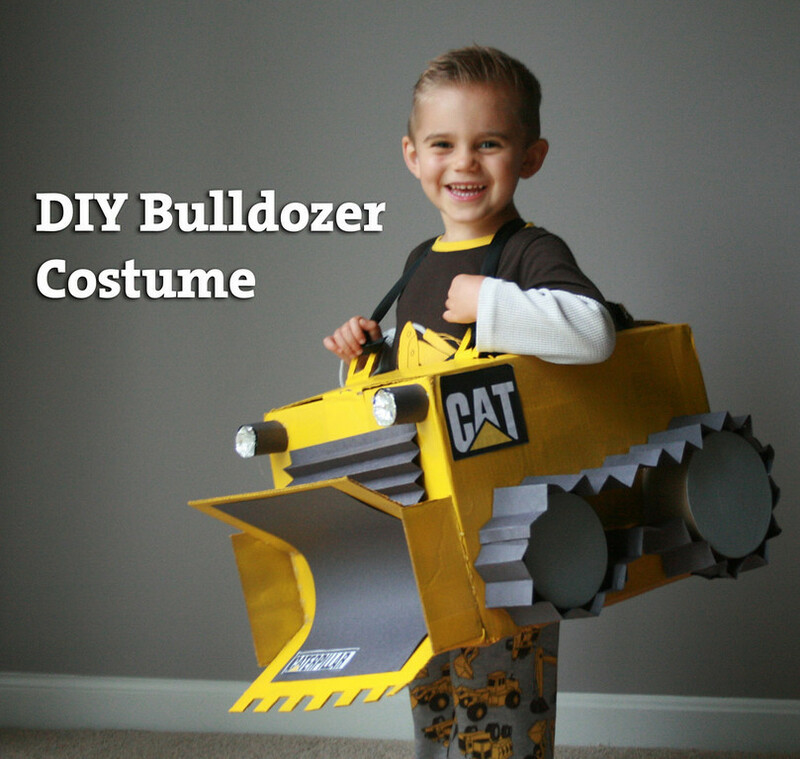 DIY Bulldozer Costume Mama Say What?! | Mama Say What?! This Halloween, my son is finally old enough to choose his own costume. He’s very into construction trucks right now, so it was no surprise when he said he wanted to be a bulldozer for Halloween. 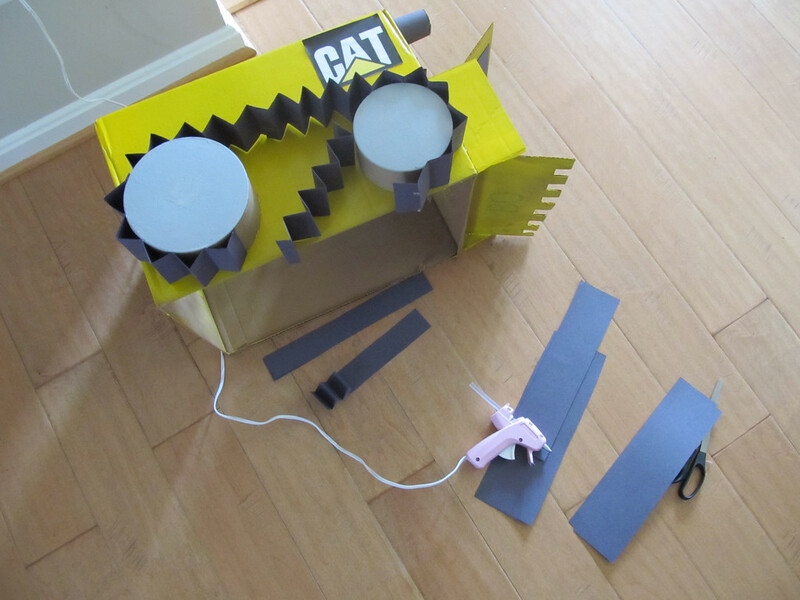 Right away I imagined I could put something together with a cardboard box and I was sure there would be plenty of inspiration online. 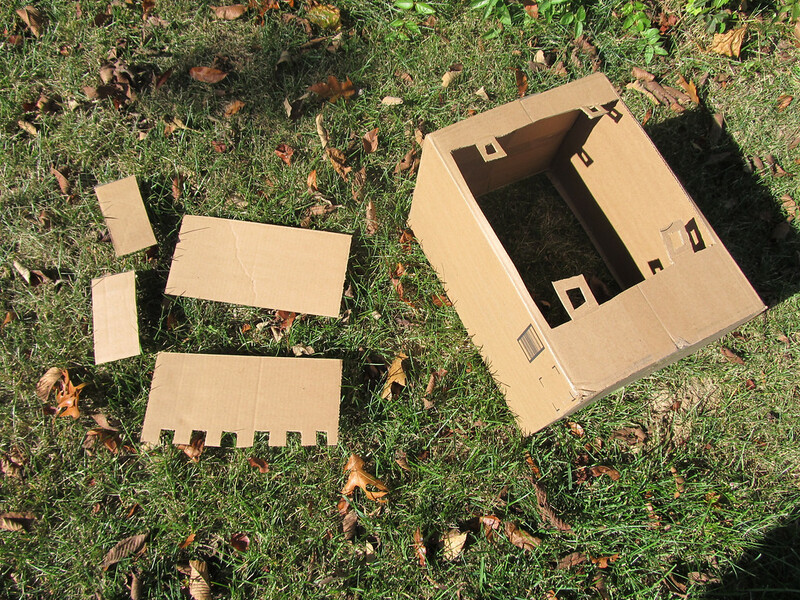 A quick Google image search produced quite a bit of cardboard box-based construction costumes. 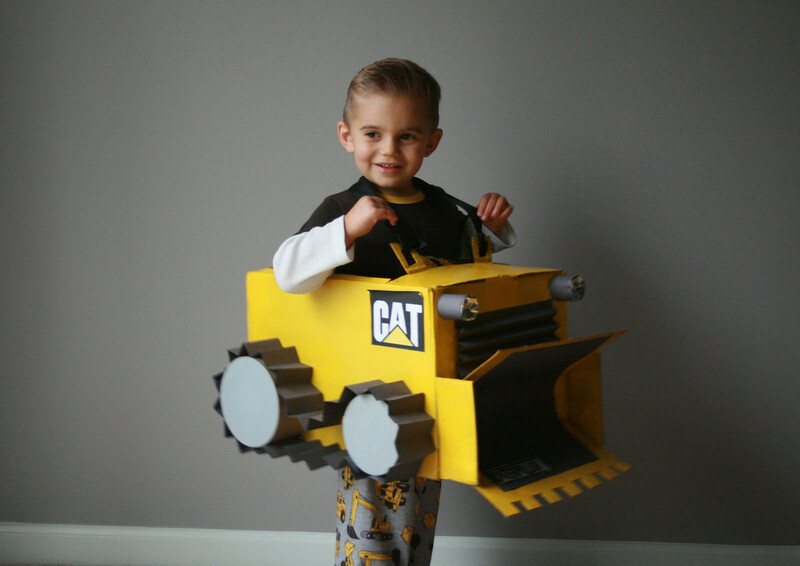 When I saw this adorable bulldozer costume, I could see right away it would be something I could recreate for my little man. Here are the step-by-step instructions for how I made it. First, I cut the top flaps off of the box. These will be used for the front bucket parts, so don’t throw them away. Then I cut the bottom of the box to have a center hole for his body to fit through, but left tabs at each corner to attach the ribbon to later for straps. 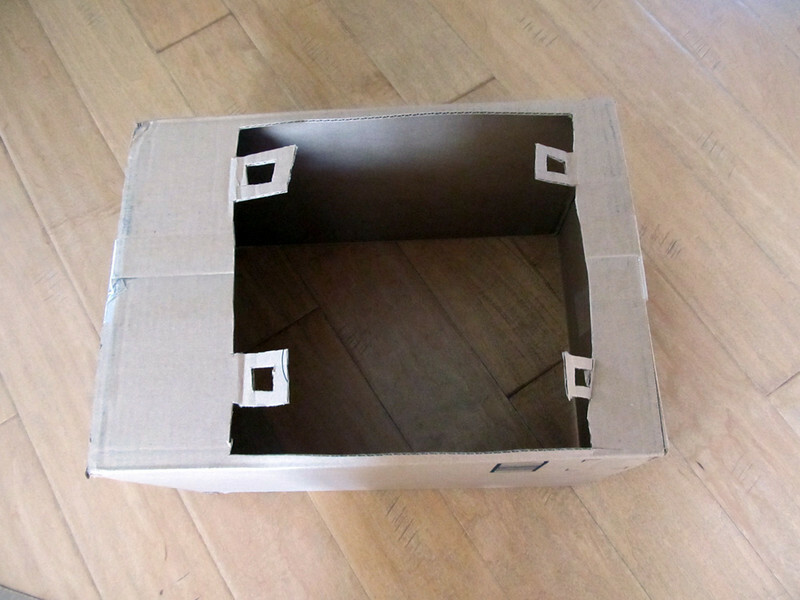 For the bucket you will need to have two long rectangles from the box flaps and two small ones for the sides. I then cut out notches in one of the flap pieces for the teeth of the bulldozer bucket. 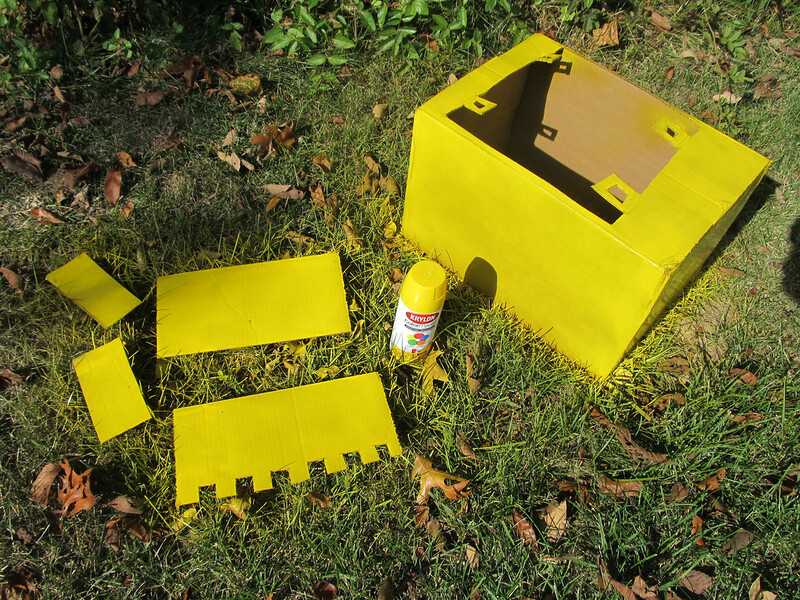 Once all cuts had been made, I laid the pieces outside to be spray painted yellow. It took a few good coats and letting it dry so I could flip the pieces over and make both sides yellow. Once everything was dry, I was ready to start gluing. 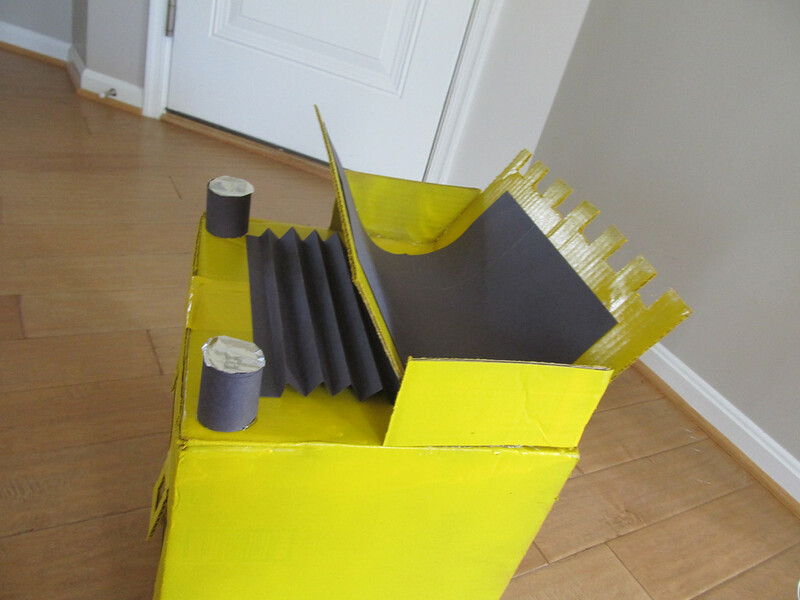 I plugged in the glue gun and let it heat up while I folded a piece of construction paper back and forth in an accordion/fan style. Then I opened it up and glued it down on the front of the box to make the “grill”. 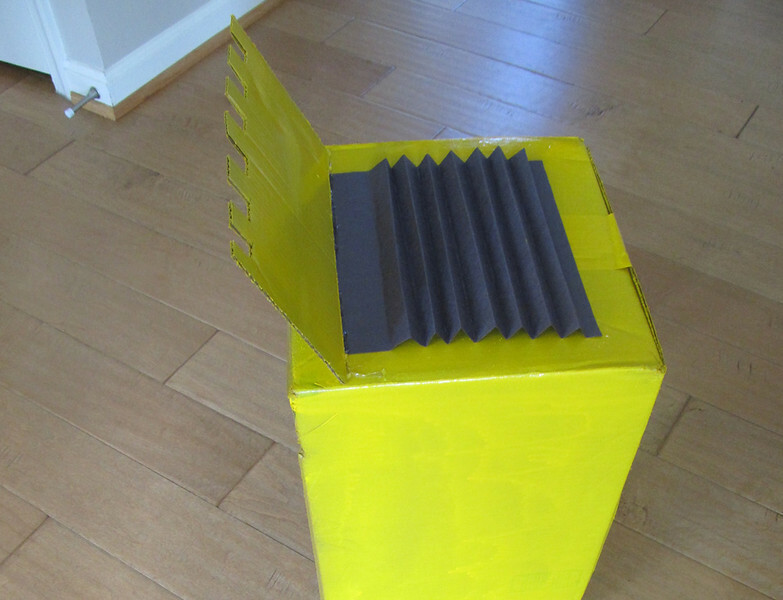 Now I assembled the front bucket by putting a line of glue along the edge of a rectangular box flap and holding it down on the box at an angle. I then ran glue along the top and bottom just to give it a very secure hold. I held it there for a few minutes while the glue cooled and hardened, then did the same for the top of the bucket. The small side pieces are the easiest to run some glue and pop on. 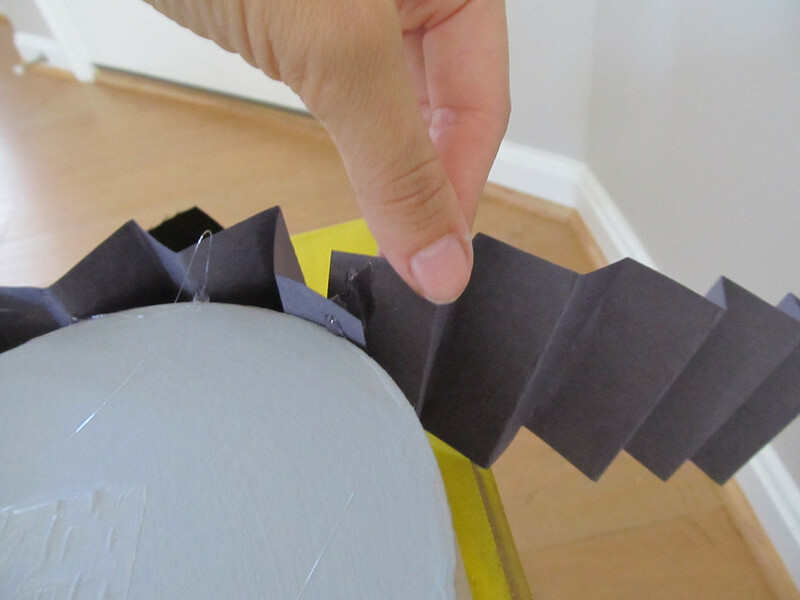 Now a piece of construction paper was laid in the bucket and glued down, giving it the effect of having a curved inside. Then I cut a couple strips of construction paper, each about two inches wide, and curled them around my fingers to form tubes for the lights. A drop of glue secured the loop and another couple drops attached them to the box. I finished them off by gluing down a couple cut out circles of aluminum foil to give a reflective look to the end of the lights. 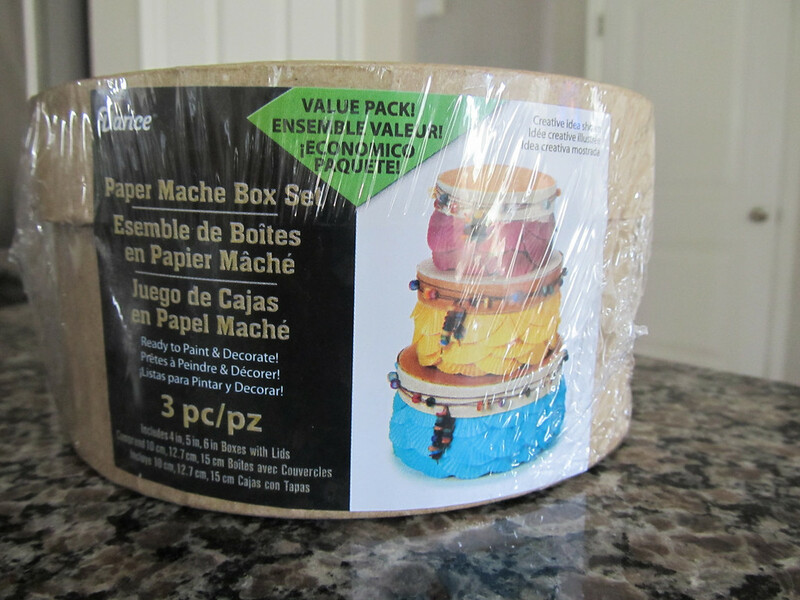 I chose the two largest round boxes from both paper mâché box set packs to use for the wheels, the largest one in back. I took the lids off and laid them open side down. Then used the glue gun to stick them down and painted the top of them with grey craft paint. I could have gotten away with leaving them brown, I’m sure, but if you don’t want to buy the grey paint you can skip this step. Once they were secure, I cut the construction paper lengthwise, about three strips per sheet. Then I folded these in the same accordion style as the grill, this is to simulate the bumpy tracks of a bulldozer. I glued down the end of a strip onto the wheel and the end of a the strip to the end of that one, working my way until I had glued the paper around both wheels, then turned it over and did the same to the other side. A Google image search brought up the Caterpillar logos. I printed them out, cut them out with scissors, and glued them down onto the bulldozer. Now I attached two long pieces of ribbon to the front tabs on the top of the box. I put it over my son’s body so I could adjust the straps to the correct height for him. I recommend crisscrossing the straps in the back to make them more secure. Then tie it to the back tabs and cut off any excess ribbon. My son has run around with this costume for days, crashing into walls and furniture, and even fully fell flat out on the front of it— miraculously, it left no damage! This box bulldozer is sturdier than it looks. Hope your little ones enjoy living out their construction truck fantasies! Added by Laura K. on October 19, 2013. The one in the link you used as inspiration was my son and the costume I threw together 2 days before Halloween!! I have had multiple people say they have come across his pic all over when searching for Halloween costumes-I had no idea it got around lol! So fun!! We aren’t big halloween people, but my son has been asking for weeks to be a bulldozer. I am not handy and I was freaking out because my alternate suggestions (cowboy, doctor, etc) were not okay with him. Then I found this. You broke it down perfectly and I put this together in a few hours. He was the hit of the neighborhood and -best of all- he was really, really proud. THANK YOU for sharing this! Thank you for these instructions. We just finished this costume. Can’t wait to show it off. We did add a smoke stack for the exhaust and I put a tiny led flashlight in each headlight so they light up. I will post some pics soon. Thank you so much for the step by step!! We did headlights from Walmart that turn on and we got orange ribbon, since his vest is orange. 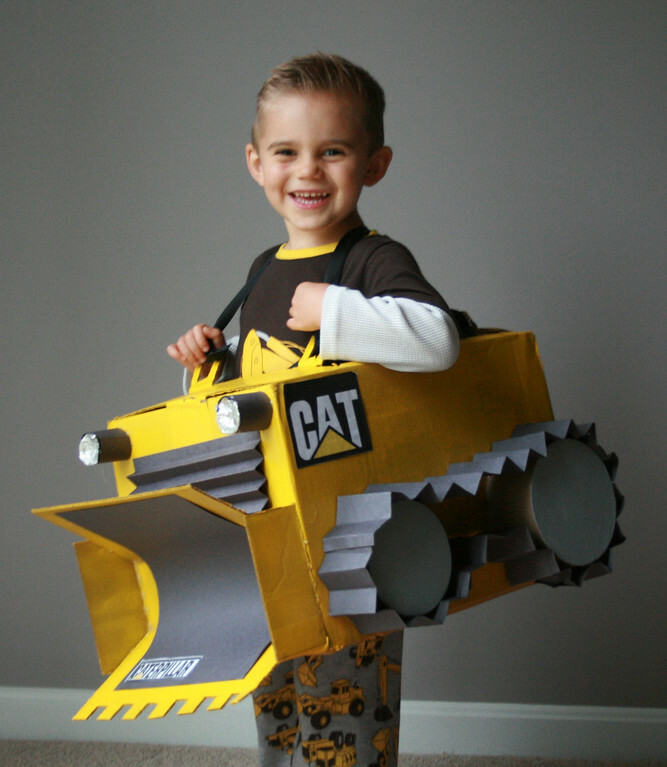 It took some time, but I think I am going to have one happy little bulldozer at Halloween! This is a TERRIFIC post!! Thank you so much for this! I managed to get it together just in time for Halloween, and it was a huge hit. Tons of compliments from the neighbors! Thank you for sharing.